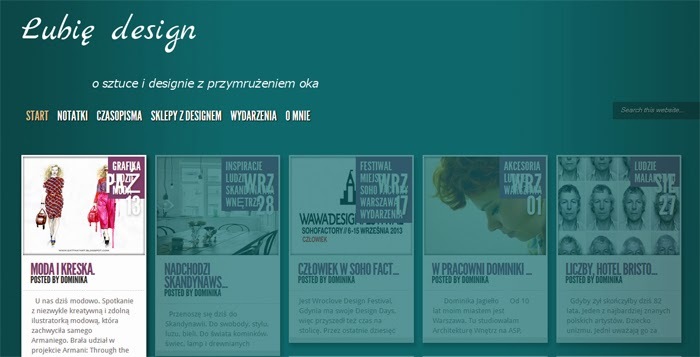 Jakiś czas temu miałam okazję udzielić małego wywiadu dla Lubię Design. Ukazał się on dzisiaj, więc jeśli chcecie się dowiedzieć co nieco więcej o mnie, wchodźcie tutaj: http://lubiedesign.pl/2013/10/13/moda-kreska/. 'I study graphic design at the University of Art in Poznań, but after I’ll get my Bachelor's Degree, I’m going to continue my education abroad. I’m the author of the www.eatthatart.blogspot.com blog, where I publish my works. Mainly they’re fashion illustrations, bloggers’ looks and commissioned portraits. If not graphic design then fashion. I’m inspired by everything around me, illustrations’ albums, thousands of photos which I found on the Internet. The artist who I admire There are so many inspiring people, that it is very hard to choose one. At the moment I could point Paula Bonet. The city which inspires me is New York. As a child I was calm (which haven’t changed till now). My favorite clothing brand is none in particular. I dream about illustrating for the biggest fashion magazines in the world. The thought which inspires me and keep me going is the posibility to study abroad. My drawings are a combination of inspiration and craft. The last exhibition is still on. It has begun on the 27th of September in the Nastawnia PoC pub in Poznań. I collaborate with the Armani brand. I was one of the few artists who were chosen by them to co-create the album with illustrations, which was shown on their fanpage. What I recall the best is the moment when I received an e-mail from Armani. In the first moment I thought it was an ad. People who I draw are models and bloggers. My first drawing, which I published on my blog, shows me how much I’ve already learned. The last one reminds me there’s a lot of work ahead of me. A favorite designer I don’t have a favorite one. Recently I really enjoy Dolce&Gabbana’s collections. I’m proud of my little successes during the last year.